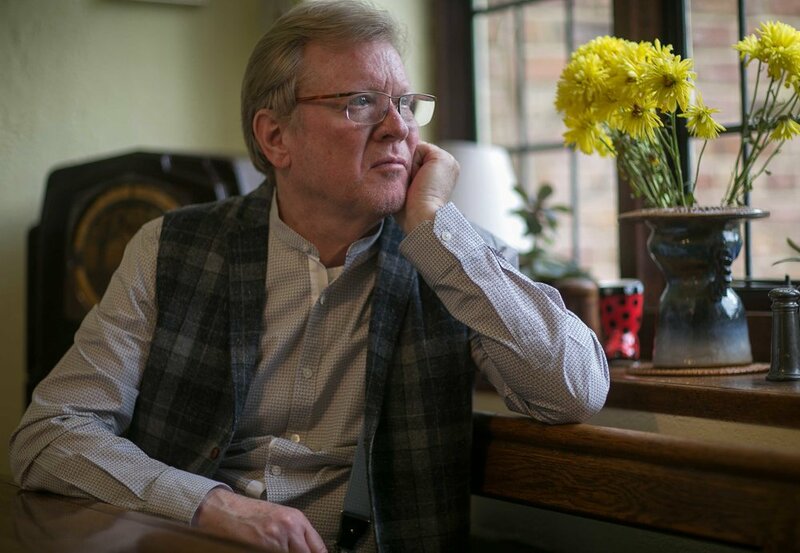 Glancing out of his sitting room window, David ‘Kid’ Jensen can see the snow falling thick and fast and doubts he’ll be going to his yoga class that evening. “Oh we’ll be going!” says his wife, Gudrun, and it’s immediately obvious why the veteran broadcaster, who recently revealed he has Parkinson’s, calls her ‘the queen of tough love’. “He never knows what to expect,” laughs the Icelandic- born former air hostess, not prone to mollycoddling her husband. “Use it or lose it,” is her mantra. Which is why she refuses to cook lunch – only dinner; doesn’t approve of too much daytime TV and insists David tries to fasten his own shirt buttons, even though it can sometimes take him 20 minutes. That said, Gudrun’s support for the man she met and fell in love with at first sight in a Luxembourg nightclub on Christmas Eve 1974, has been unstinting ever since. Both admit their life together has been blessed, both personally and professionally. It’s clearthat they absolutely adore their family and that the experiences they’ve had as a result of David’s job have been amazing – holidaying with the McCartneys was one. “Linda McCartney was an angel; a very, very special person,” says David. Gudrun (65) was even taught by Michael Jackson himself to moonwalk– a skill, despite a hip replacement, that she’s now happily teaching their seven-year-old granddaughter Ottilie. 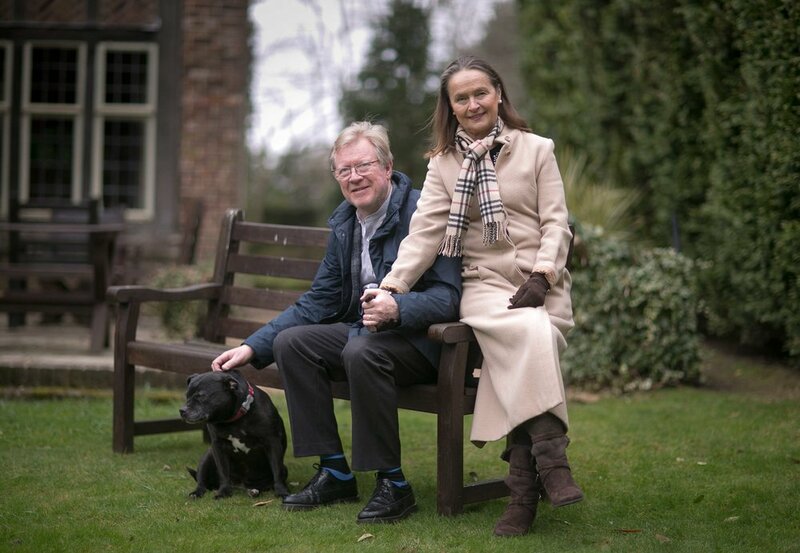 It was after years of such good, but clean, living (David rarely drinks) that Gudrun suddenly found herself supporting her husband when he was diagnosed with Parkinson’s more than five years ago. Though he had the warning signs – waking up shaking in the mornings and dragging his feet – the news came as a nasty shock. “I was close to being devastated by the news,” admits David (67). “I was scared; I was angry and going through all those emotions, but in the end I realised it was up to me to change. Their reaction – acting on a neurologist’s tip – was to keep quiet about it to avoid people constantly asking him how he was. Apart from immediate family and friends – and David’s local priest – nobody knew until earlier this year when he decided to speak out to boost awareness and to help others. “I never denied it but I never talked about it,” says David, who’s now joined fellow sufferer, comedian Billy Connolly as a VIP supporter for the charity Parkinson’s UK. His reaction was typical of a third of sufferers who feel the need to hide their symptoms, which can include tremors, slow movement and rigidity, according to the charity’s research. David has also suffered from depression, insomnia and hallucinations from the medication he was prescribed. So why the sudden decision to tell the world? A big believer in laughter being the best medicine, he was inspired after seeing Billy Connolly make light of the condition on stage and hearing Sky Sports darts presenter, Dave Clark, talk about the illness. It clicked that he, too, could help others by talking openly about his experience of this degenerative neurological condition. Equally, he was also fed up of making excuses for taking pills every four hours in the BBC local radio studio where he still does a chat show. “I’d say I had stomach ache or was taking antibiotics – anything but admit what the truth was,” he says. Once the decision was made to ‘come out’ there was no going back, but it’s not one he regrets. “There is no better feeling in the world than being able to tell people with Parkinson’s, ‘you are not alone’,” he says. The level of support he has received has also been astounding – from his employers telling him not to worry about losing his radio contracts, to old friends and acquaintances getting back in touch. Even in the local supermarket carpark he’s found support when he was walking towards a man visibly having tremors. There’s no denying though it is not an easy condition to live with today – particularly the depression that it’s sparked – and the future looks uncertain. But David and Gudrun both refuse to feel cheated or worry too much about tomorrow. “We’ve had the most incredible life. How can we feel cheated?” asks Gudrun, who still works part-time in a local auction house but is prepared to become David’s carer when the time comes. For now, they rely on their ‘wonderful’ family and friends, their faith and music to help get them through.